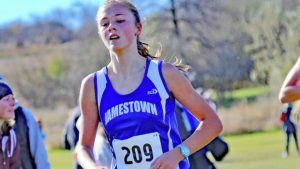 CHICAGO ( Gatorade POY Feb 13, 2019) – In its 34th year of honoring the nation’s best high school athletes, The Gatorade Company, Wednesday announced Meghan Ford of Jamestown High School as its 2018-19 Gatorade North Dakota Girls Cross Country Runner of the Year. Ford is the first Gatorade North Dakota Girls Cross Country Runner of the Year to be chosen from Jamestown High School. The award, which recognizes not only outstanding athletic excellence, but also high standards of academic achievement and exemplary character demonstrated on and off the racecourse, distinguishes Ford as North Dakota’s best high school girls cross country runner. Now a finalist for the prestigious Gatorade National Girls Cross Country Runner of the Year award to be announced in February, Ford joins an elite alumni association of past state award- winners in 12 sports, including Lukas Verzbicas (2010-11, 2009-10 Carl Sandburg High School, Orland Park, Ill.), Megan Goethals (2009-10, Rochester High School, Rochester Hills, Mich.), Jordan Hasay (2008-09, Mission College Preparatory Catholic High School, San Luis Obispo, Calif.) and Chris Derrick (2007-08, Neuqua Valley High School, Naperville, Ill.). The 5-foot-6 sophomore raced to the Class A state championship this past season with a time of 17:56.9. Ford also won the Western Dakota Association championship, the Devils Lake Invitational, the Blue-White Invitational and the Andrew Carlson Distance Challenge. She took 16th at the Foot Locker Midwest Regional championships and 17th at the Nike Cross Nationals Heartland Regional championships. Ford has maintained a 4.0 GPA in the classroom. She will begin her junior year of high school this fall.